We all come across individuals who dazzle us. People who seem to have it all and then some. People who have earned our sincerest respect. People we want to idolize and emulate. Dr. Michael E. DeBakey is such a figure. As a future doctor, my colleagues and I will build on the foundation set forth by physicians of the past and current generation. Medical instrumentation, techniques, and knowledge have been refined significantly over the last century, and many of these advancements can be attributed to Dr. DeBakey himself. As a prominent cardiothoracic surgeon, he pioneered so many modern day techniques… it’s almost mind boggling! Patch-graft angioplasty to repair blood vessels, coronary artery bypass surgery, usage of a bypass pump, the roller pump (used in the heart-lung machine), etc. etc. etc. It’s sad, but most of us will die before experiencing even one achievement of a lifetime comparable to his many. His humble approach to fame and steadfast dedication in cardiothoracic medicine has provided the world with new ways to combat heart disease. I view Dr. DeBakey as a quintessential example of what we should all aspire to become – productive members of society, dedicated to their trade, who selflessly give of their time and energy in the name of helping others. 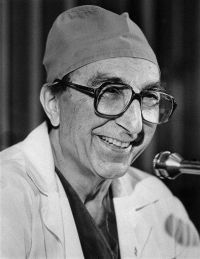 Medicine (and humanity) lost an invaluable asset last night; however, Dr. DeBakey’s life accomplishments are a testament to what the next generation of physicians must provide healthcare – revolutionary new ideas and a never ending commitment. …those are some pretty big shoes to fill for any pre-med.